A fun and memorable saying that is displayed at the Mayflower Coffee Shop in Chicago ~ "As you wander through life, brother, whatever be your goal, keep your eye upon the donut, and not upon the hole." 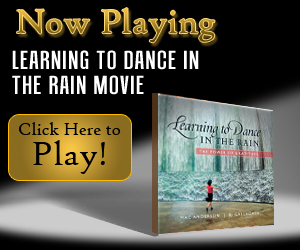 Share this today to encourage others to start, "Learning to Dance in the Rain." Perfect to share now, during National Dance Week, which celebrates the beauty of dance and its ability to enrich our lives. "When we choose not to focus on what's missing from our lives but are grateful for the abundance that's present... we experience heaven on earth." Enjoy the “Learning to Dance in the Rain” movie.